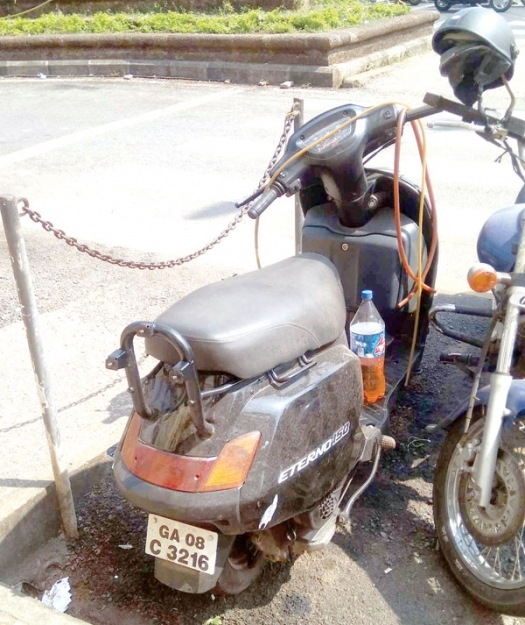 MARGAO: The rent-a-bike operators have virtually taken over the parking areas in Margao. They have also occupied the scarce parking space along the municipal building. The general public, who visit the municipality, have to first go around the building and the garden to hunt for parking space. Many of them are forced to park in the area reserved for motorcycle taxis or municipal staff. The shortage of two-wheeler parking space is primarily because more than fifty rent-a-bike bikes are parked around the building. At least six individuals hire out bikes to tourists without permission from the municipality. The rent for a bike is Rs 500 per day. But the operators do not pay any fee to the municipality even though they sit on chairs in the outer corridor of the municipality and solicit customers. If any of the bikes run out of petrol, they have bottles of petrol ready along with pipes to help them transfer it into the bike’s tank. But the most shocking part of their business is that they offer bikes with the black and white number plate on rent. Herald asked the operators whether they were allowed to give such bikes on hire to which one responded saying that they don’t park them here and that they get them from somewhere else if needed. The other operators did not respond. The operators prefer parking bikes with black and white number plate even though it is illegal to rent it to tourists. Municipal Chief Officer Siddhivinayak Naik, informed that in the first week of October he had stopped the operators from doing business around the municipality. He said he would depute his officers to check on them and would be take strict action against them.